Hey look at that. 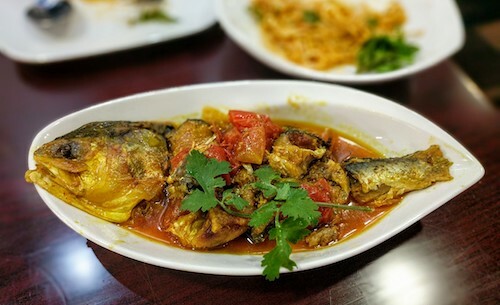 The city is now awash in Burmese restaurants. And by that, I mean there are now two... both of which are not far from each other on the Bensonhurst-Gravesend border. 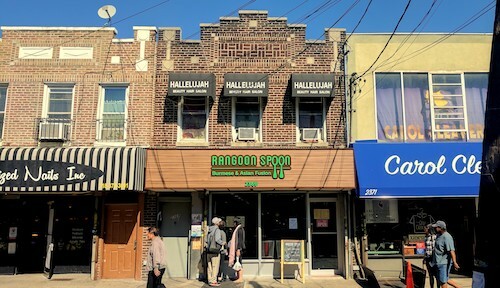 The latest is Rangoon Spoon on 86th Street, which is technically still in a soft opening period but has been offering open hours many days the past two weeks. In the space of what was once a couple different beauty and hair salons, a modern renovation has turned this address into a restaurant. A few pieces of art, marionettes, and some Buddhist statues make it feel a bit Burmese, but the cooking is just right and thoroughly exudes the culture. During the soft opening, the menu is limited but still offers quite a few options. A quick glance at the full menu shows an almost overwhelming array of choices. 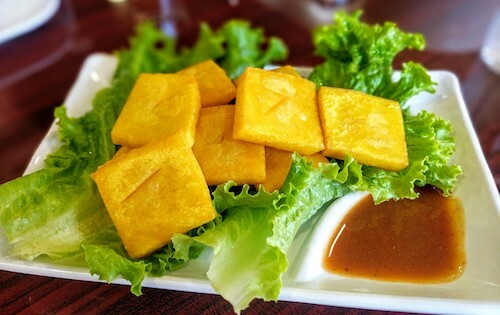 Like with other "tofu" dishes of Shan state origin, the fried Shan tofu ($3.99, below) is made from chickpea flour which gives it its yellow shade. 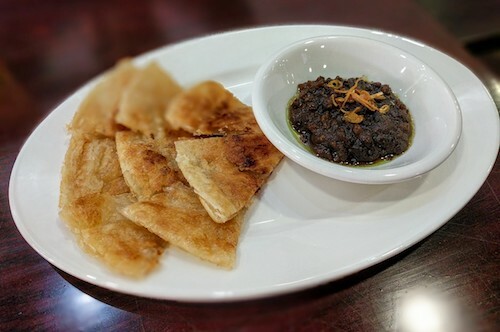 Paired with a tamarind chili dipping sauce, it makes an excellent appetizer and a quick way to get your tastebuds going. The green tea salad ($6.99, below) is the best in the city since the passing of the long gone Burmese restaurant that used to be on Roosevelt Avenue in Woodside, Queens. 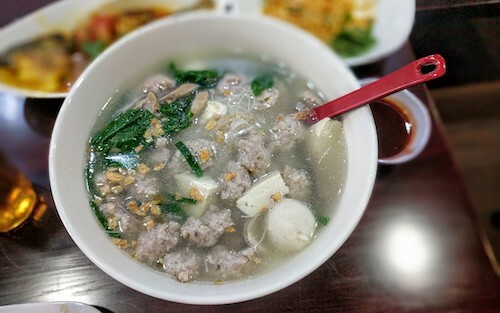 Known as laphet thoke, this salad is a combination of fermented green tea leaves and many textures and flavors. Rangoon Spoon makes it beautifully, with all the right proportions of ingredients. 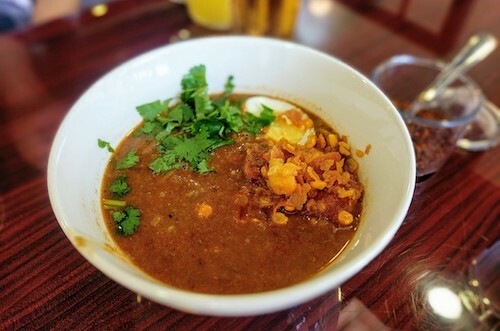 Each morning on my two trips to Myanmar, I awoke craving a bowl of either mohinga or ohn no kauk swe, both of which are breakfast dishes available here all day long. 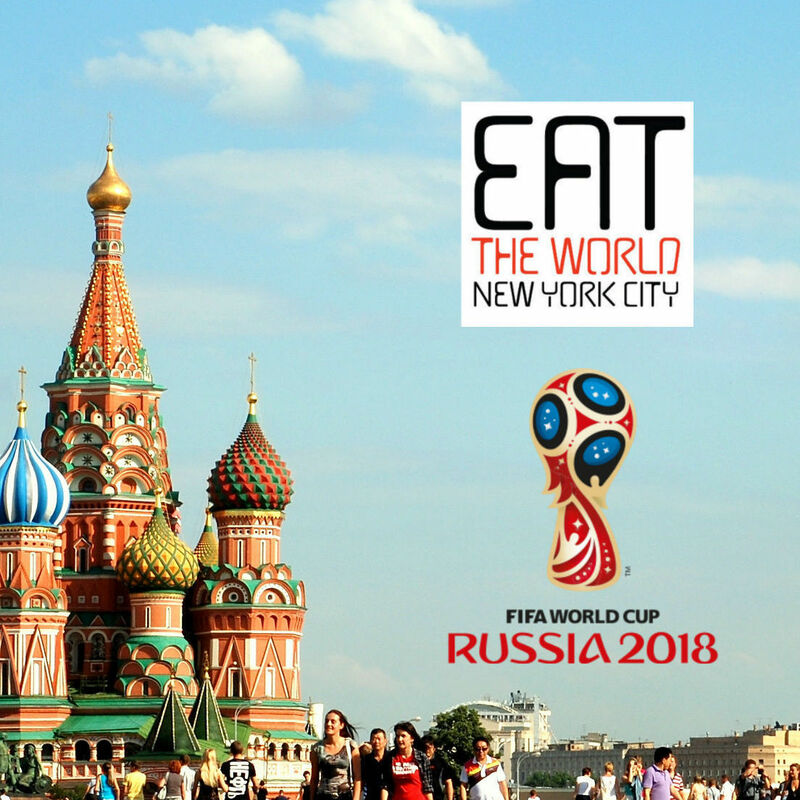 One of the best aspects of this was that each vendor would have their own recipe and tastes between them and from city to city would be different, making the dish always fresh and never old. 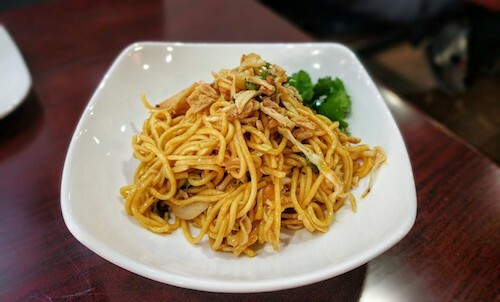 Another good rendition of mohinga ($6.99, below) is now available here, and New York City is all the better for it. While we might still be partial to the version at Together Myanmar Restaurant, once a spoonful of the dried red pepper flakes was added, the bowl came to life. With no real restaurant culture for noodles in Myanmar, you will find all the dishes we sampled here on the street sold by vendors. 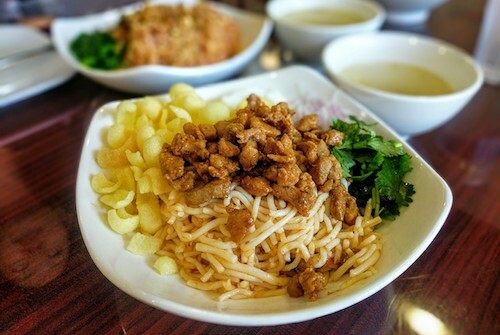 Everything is always mixed and served to order, and most are eaten at room temperature like the nan gyi thoke ($6.49, below), made with thick rice noodles and chicken. Parsley, onion, and crispy crackers garnish and should be mixed in as desired. 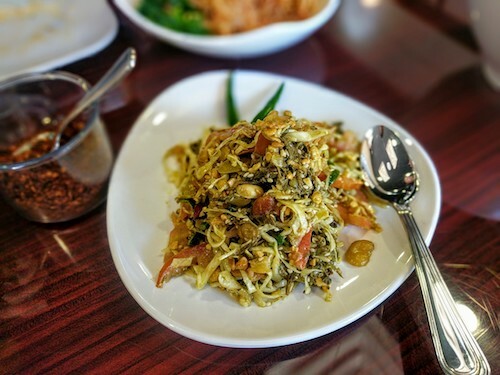 As with the Shan noodle ($6.99, below), the basics and traditional flavors of Burmese cooking are all there, but the last dash of flavorful seasoning might be just off. Once the chef finds this, both dishes will be delicious. 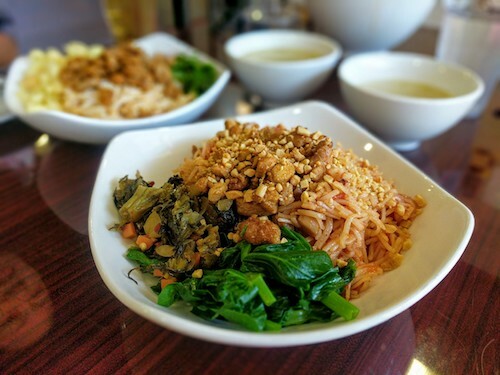 The Shan noodles come with a pile of pickled vegetables which would also benefit from being more sour, as these usually play an important role in the dish. That being said, our next visit will order these two items for sure. 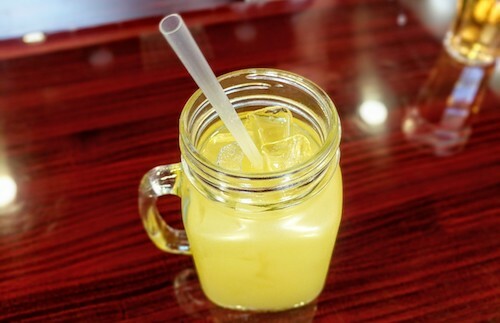 I never noticed calamansi in Myanmar, but the calamansi juice ($2.50, below) here is worth ordering as your drink. Burmese teas are also available and recommended. We are sure to go back soon and I will tweet updates when the restaurant opens officially and keeps consistent hours. Please follow us on Twitter for information like this.